Week 7 brought improved visibility, but strong currents made the diving strenuous. Another friend has checked in. Estrelita is a turtle we first met in 1992 and Peter named her Estrelita. He still can't explain why. Estrelita had tumors. Estrelita was not sighted in 1993 but the next year she gave us two surprises. Estrelita sported the long tail of an emerging male and his tumors were improving. By last summer, the only evidence of former tumors was some scarred tissue. We are not sure why we haven't seen Estrelita before this week. 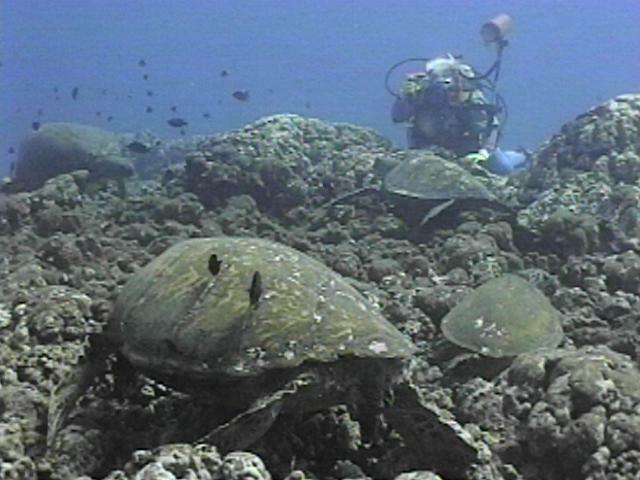 Was he at the French Frigate Shoals or does he simply not frequent the Honokowai Turtle House any more? Perhaps he now avoids people. Certainly when Peter first sighted him, Estrelita swiped his flipper at him. (Regular readers know this indicates that the turtle is not happy with you.) A few days later, Ursula sighted him swimming straight for her. Estrelita slowed his swimming just long enough to execute one swipe of his right flipper before continuing on. It is as if this turtle gave each of us on separate days the turtle version of the one-finger salute before swimming away. This is not in itself puzzling. We have mentioned previously that males undergo some rather pronounced behavioural changes during puberty. The once tolerant daily presence at the Honokowai Turtle House now seems to be a crabby recluse. Then again, perhaps his shell holds the answer. Something happened in the 11 months since we last saw Estrelita. The rear portion of his carapace is damaged and we are uncertain what has done it. A boat propeller? Some eroding disease? It looks as though some of his shell has been removed and his skin is showing underneath. It is not unlike what we would look like if part of our big toe nail had been removed. Estrelita would have to stay and give us a better look for us to determine this for sure. If you could erase the spectre of tumors, you could easily conclude that green sea turtles live enviable lives. Whatever food they need grows a few flipper strokes all around. They've got it made. They live a life of ease known only to, oh, perhaps the British aristocracy. In fact the only demands on each day are the necessary trips to the surface for fresh air. Other than that they are free to do whatever they want. And they do. Being with them again this week, we marvelled at how much time they spend just resting with their own kind. It is difficult to fully understand why they are resting because resting implies you did some serious activity before resting. Sea turtles just rest at the bottom and take each day as it comes. A lesson in life for us all. Turtles scratch. How do you scratch when you only have flippers and your body is really mostly shell with head, tail and four appendages sticking out all of which are covered with reptile armoured plates? You might well ask. Turtles have solved this problem rather nicely and one of the most enjoyable things you can do is watch an itchy turtle. 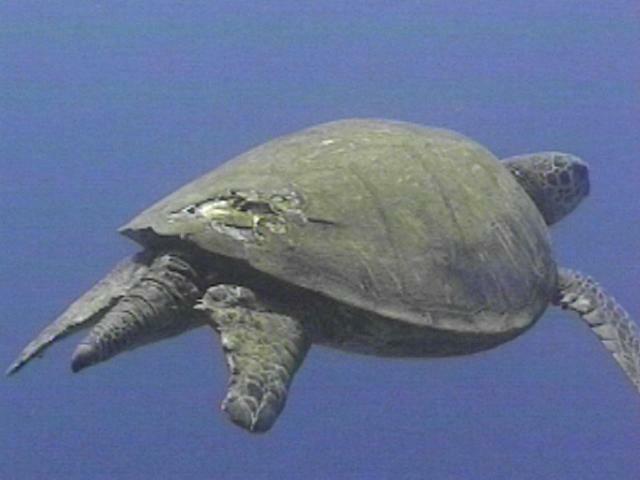 Turtles use rock ledges or coral heads to scratch. Clearly this is one of the reasons a great deal of coral at our dive site is reduced to rubble each season. If the carapace is itchy, the turtle finds an overhanging ledge. Then it goes up on all fours and scrapes the shell back and forth along the rock until the itch is satisfied. 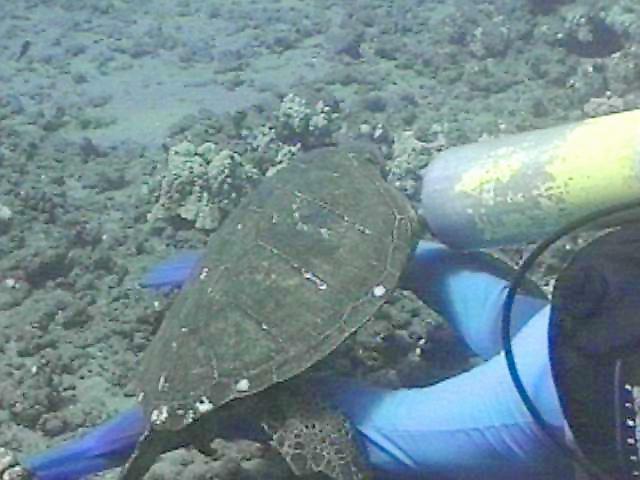 This can go on throughout an entire dive, with the only interruptions coming when the turtle takes a trip or two to the surface for air. An itchy plastron can be satisfied anywhere there is hard substrate solidly attached to the bottom--the bigger the better. 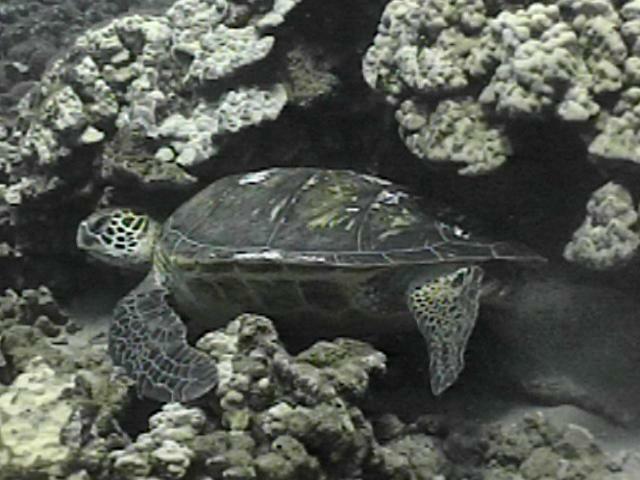 The turtle lies on the rock and grasps with its front flippers. Then it drags itself back and forth along the hard rock to satisfy its tummy itch. Plastron itches make for the best photo opportunities. Considerable acrobatics can ensue as the turtle squirms and shuffles to get just the right part of its plastron scratched. Front flippers press the turtle down against the rock and rear feet press against ocean for that extra scrape and grate. Head, tail, flippers, and feet also get itchy. The strategy is the same. Drag body part back and forth against something hard. Even turtle armpits get itchy and chins and eyelids. Yes, turtle butts get itchy too, in which case the turtle must find a projecting rock outcropping and then maneuver rock between carapace and plastron. Then the serious job of dragging body back and forth occurs. This is done because the turtle has discovered it easier to drag itself against rocks than expecting rocks to do the work. Rocks get worn down by this process. Turtles don't seem to. Turtle 96-29 has as much personality as she has tumors. As we wrote last week, once she decided we were harmless she chose to demonstrate to us who's boss. The brassiest incident so far occured this week. She was on the surface for a breath of air and Peter was videotaping her, perhaps ten feet below that. Then, lungs full of air, flippers exploded with activity and she began a vertical descent right at Peter. The resulting video shows a turtle swimming straight into the camera only to avert a collision at the last minute, flippers brushing lens. Turtle then proceeds to swim upcurrent to the Turtle House as Peter and video follow the action. Ursula, in the meantime, is lying quietly on the bottom anticipating an interaction between 29 and Limu, the turtle already resting there. 29 approaches, swims past, does a quick circuit, swims in Ursula's face, then drifts behind her and lands directly on the back of her legs. Turtle and human lie like this for several seconds. Human wonders whether it is wise to allow contact with such a badly tumored turtle knowing a virus plays a part in the disease. Human gets the creeps and slips out from under turtle. Turtle rests contentedly and proceeds to lower her head, close eyes and snooze. Turtle 29 has become quite special. Looking at all her tumors and the beginning of a sunken plastron, we doubt she will be around for 1997. These turtles just seem to stay around long enough for you to get to care about them, then they come down with tumors and evaporate from your life. We wish they wouldn't do that.